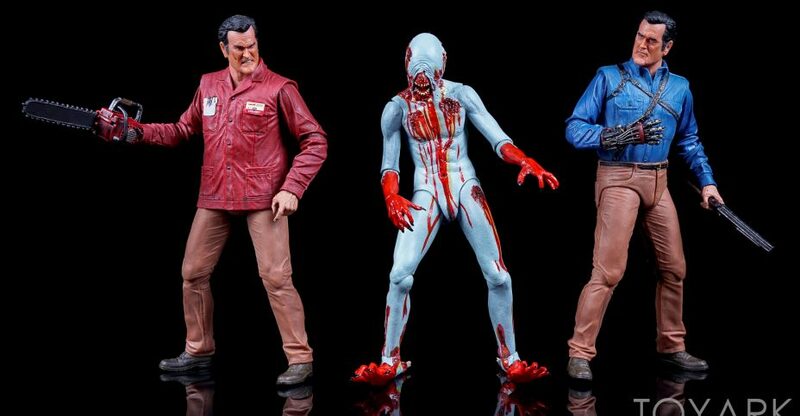 The excellent first assortment of Ash vs Evil Dead 7″ Scale Figures are now available. Fans can pick them up directly from the NECA Amazon and Ebay Stores. The figures are priced at $21.99 each plus shipping. The first wave includes two version of Ashley Williams and the demon Eligos. We were the first to check these figures out, and fans of the show should grab them for sure. The figures are scheduled to ship out to retailers next week, so look for them in stores within the next three or so weeks. Read on to see a few photos from our own Ash vs Evil Dead Series 1 Photo Shoot. Thirty years after he took down the Deadites, Ash Williams is back in the Ash vs Evil Dead TV Series. After accidentally unleashing Deadites, our square jawed hero must once again face the evil that took his friends and his love so long ago. With new recruits Kelly and Pablo, “El Jefe” and the Ghostbeaters team sets out on a road trip to end all road trips, all while being pursued by the mysterious Ruby and police officer Amanda Fisher. They look to put the Evil Dead back in hell for good. Just ahead of the Season 2 premier, NECA will be releasing their first series of 7″ scale figures based on Ash vs Evil Dead. The introductory wave includes Value Stop Ash, Hero Ash and the demon Eligos. They will also have a box set featuring a bloody Hero Ash and two Demon Spawn from the season 1 finale, which is due out later. NECA sent along the Ash vs Evil Dead Series 1 figures, and we have the first look at the final production version. Read on to check out over 135 photos and a full review! NECA has released the first photo of the new Ash vs Evil Dead Series 1 figures in packaging. The figures come in collector friendly window boxes. The first assortment includes Hero Ash, Value Stop Ash and the demon Eligos. The figures will be released later in September. NECA presents a new line of action figures based on the Starz TV series Ash vs. Evil Dead. The series follows Ash, stock boy, aging lothario and chainsaw-handed monster hunter who spent 30 years avoiding responsibility, and the terrors of the Evil Dead. The Series 1 assortment includes Value Stop Ash, Hero Ash and Eligos. 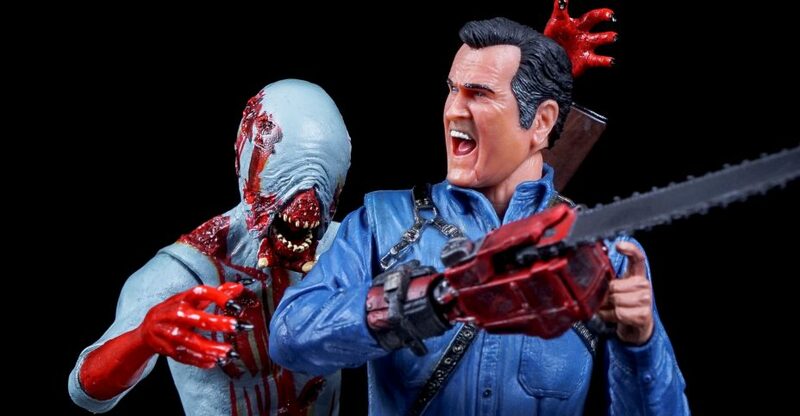 Value Stop Ash comes with two interchangeable head sculpts, alternate wooded hand, and murderous doll. Hero Ash comes with two interchangeable head sculpts, alternate mechanical hand, and shotgun that fits in a back holster. Eligos features plenty of gruesome detail. Figures stand approximately 7” tall and are highly articulated. Click the banner image above to see the new photo. 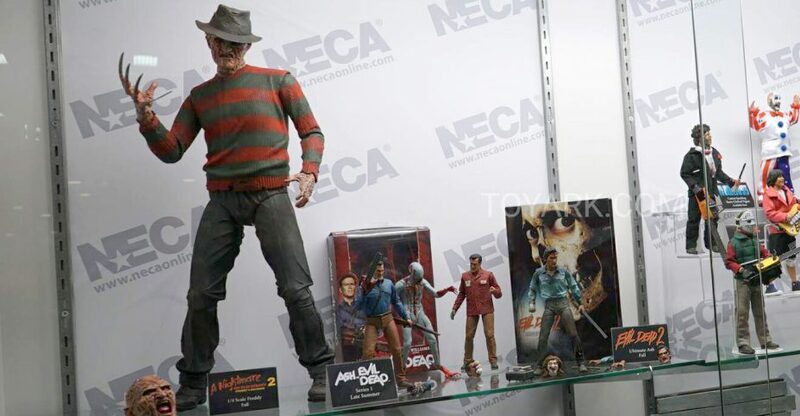 Ahead of the event, NECA shared a new photo. Check out the new pic by clicking the image above. Read on for the photos and any available info.